President Uhuru Kenyatta has sounded a warning to his Cabinet Secretaries whom he accused of politicking at the expense of service delivery to the people. 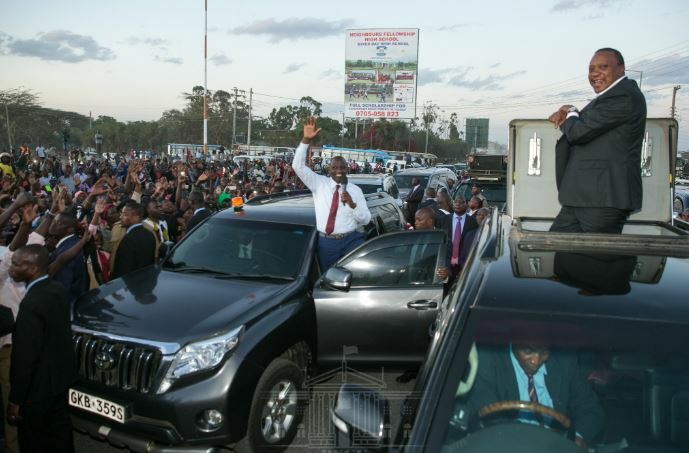 Addressing residents of Kitengela town on his way to Arusha Thursday, President Kenyatta told members of his Cabinet to choose between politics and implementation of government agenda in their various dockets. “We will not be fed by politics. We will be fed by our efforts and hard work that will improve the lives of all Kenyans,” said Kenyatta. He added: “Tell those who come to you politicking that you don’t need politics. Tell them you need water, roads and education for your children. Tell them to stop their corrupt ways, and tell them not to go around dividing Kenyans along tribal lines. President Uhuru further reiterated the need for a united country, urging Kenyans not to accept to be divided along tribals lines. “Raila & I used to compete politically but we are now united. We need to decide as Kenyans that we will live together peacefully and work together to develop our nation and East Africa. Politics cannot feed us, we will be fed by our hard work,” said Kenyatta. “Elections will come & go but I assure you today that Kenyans will not shed their blood again because of politics. Peace in the country implies that investors will have the confidence to invest in industries which will have the effect of providing jobs to our youth. “I want to point out to all Kenyans that you should not be wondering where your neighbour comes from. When you go home today, look for your neighbour and assure him that his problems are your problems and that you are there to help him. That is the meaning of the handshake,” declared Uhuru. The President is attending the East African Community Heads of State Summit in Arusha, Tanzania.